The main aim is to let people know about Firefox OS and help them buy a device online if they are interested. 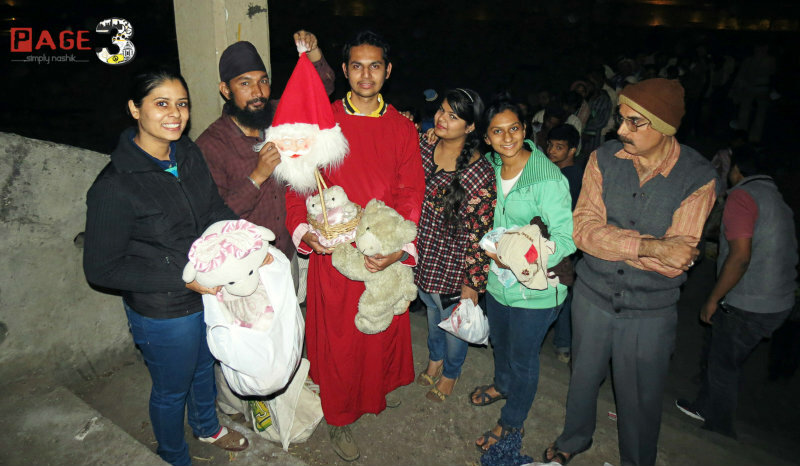 Volunteers from the Nasik Moizlla community will be helping with the outreach work. Activities, questions, comments and suggestions will be recorded by the documentation volunteers to be shared with the wider audience. Both the Firefox booth were visited by approx. 10,000 attendees. 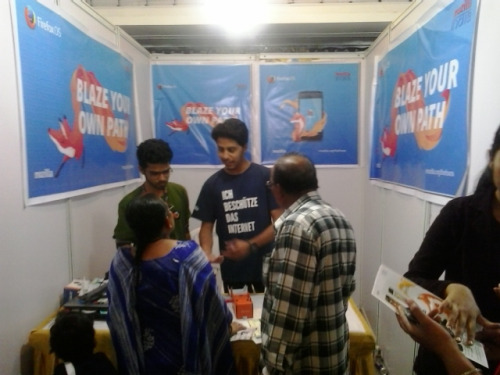 The attendees were curious and showed willingness to learn the same and to buy the FirefoxOS Mobile phones. 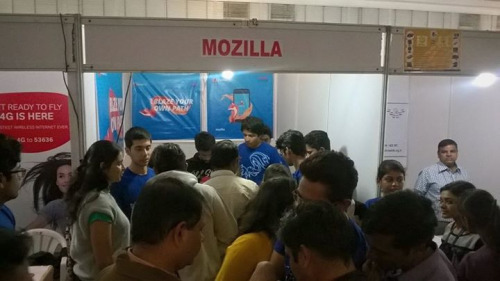 The volunteers got engaged in solving the various questions which the enthusiastic people had in their minds about FirefoxOS. 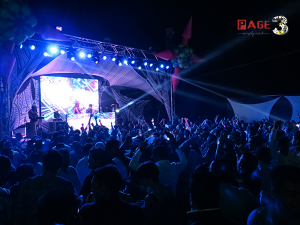 The booth was also having 4 cellphones which have been launched in India by the partnered companies. 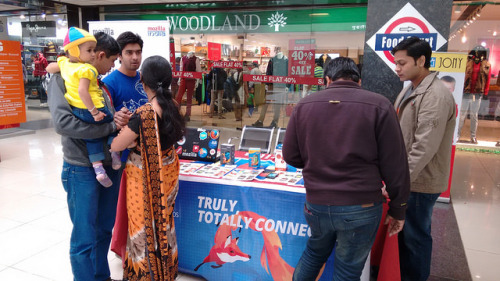 People were given hands-on experience of the phones, where they operated and witnessed the amazing FirefoxOS. 2) Using Firefox smartphones are relatively easy when compared to Android. First-time smartphone users will not encounter much difficulty in operating the OS. The call, messaging, contacts and Firefox browser icons are always present on screen and the experience is more like using the home screen of Android with swiping left and right giving to access apps. On the home screen, there’s a bar showing “I’m thinking of…” through which users are directed to Google search. Accessing Internet on the Firefox OS is very simple and user-friendly. 5) WhatsApp is not available directly. Yes, you got that right. The official WhatsApp instant messaging application is currently not there in Firefox Marketplace . “Users can connect to WhatsApp via third party app called ConnectA2,” said James Ho, senior director, Firefox Mobile Devices Group. We tried to connect to WhatsApp on the Intex Cloud FX smartphone using the ConnectA2 third party app and we failed. ConnectA2 asked for nick name, country and mobile number to register. Then it asked to enter a six-digit code which the app sent via SMS. The SMS never arrived! We also tried the voice call feature to get the code but failed again. The ConnectA2 app should have worked but we have no clue as to why it failed us on the Intex Cloud FX. This is our hero Vishal Chavan being interviewed during the CAN IT Expo! Vishal talked about the ?#?FirefoxOS? powered cheapest smart phone, he also talked about Mozilla and Opensource smile emoticon smile emoticon ?#?FxOSNashik? 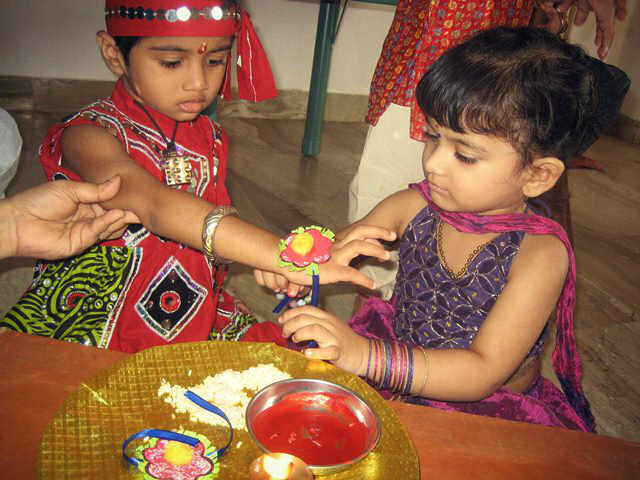 Raksha Bandhan-Nashik Celebrates the bond of LOVE!